I’d like to start by saying that when I first saw this photo of Gwendolyn Hooks, I thought that she looked like the nicest person in the world. And now that I am the “newby” on The Brown Bookshelf team, and am ALWAYS in need of someone to show me the ropes, I can personally confirm that my first impression was spot on. Then when I saw her interview from 2011, I figured what better Throwback selection could I make? So here it is, enjoy. And thank you, Gwen! Somebody forgot to tell Gwendolyn Hooks that right-brained thinkers aren’t supposed to be creative, or that left-brained thinkers aren’t supposed to be math-oriented. Not that such warnings would have mattered. Gwendolyn’s passion for educating and inspiring youth would have had her employing both brain hemispheres anyway. This former middle school math teacher has written fifteen books for children, including twelve easy readers and three non-fiction titles. She is a contributor to magazines such as Highlights for Children and JAKES. 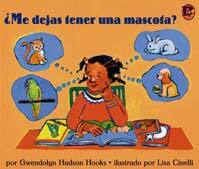 Her books, Mystery of the Missing Dog, Three’s A Crowd (Scholastic Book Fair selections), and Can I Have a Pet? (Bebop Books) have sold over 230,000 copies. Military kid. Seafood lover. Cereal box reader. On Day 24, The Brown Bookshelf is pleased to shine its author spotlight on Gwendolyn Hooks. BBS: Hi, Gwen! Welcome to The Brown Bookshelf. GH: Thank you for the invitation. BBS: The past year has been fantastic for you as far as publications go—8 books released by Capst one within a five month span! I know there were years of hard work, though, that led you to this point of success. What was it that inspired you to make the leap from middle school math teacher to children’s book writer? GH: When I was working on my nonfiction books, I would get up at 4:30 AM and write until 6:00 AM. Then I taught, tutored before and after school, planned lessons, chaired my department, attended educational workshops, and fell asleep at critique meetings. I decided what I really wanted to do was write, so I called it quits. But I still teach. I can’t quite get away from it. I work with the Arts Council of Oklahoma City and teach creative writing in after school programs. Last fall, I taught a poetry workshop for senior citizens. They wrote amazing poetry. I’m doing it again this spring. BBS: Wonderful! That’s sounds like a rewarding experience. Speaking of experiences, you grew up as part of a military family and lived in various places throughout your childhood–like Georgia, Texas, Washington, and Italy. Besides your love of travel, what did these early experiences instill in you that continues to impact your writing today? GH: Friendship is a big one. The importance of friends and finding your place in a new community. Sometimes we moved during the school year, so I had to walk into a new class with all those eyes watching me. One time my class didn’t have an extra desk. I sat on a stool. In front of the class. Horrible! It was only a few minutes, but it seemed like a lifetime. I try to remember those feelings and be sensitive to issues like that in my books. BBS: The first children’s book manuscripts you actually wrote were non-fiction titles, correct? What drove the decision to focus on non-fiction initially? GH: My first published work for children was a magazine article about prairie dogs that carried the plague. Although, it was only dangerous to other animals I found it intriguing that the plague was still around. But after that, I had four fiction early readers published. Then an opportunity came my way to write those three nonfiction books. I love fiction and nonfiction. In fact, I love almost all kinds of books and writing. I’m still experimenting, trying to figure out where I belong in the writing world. BBS: Can I Have A Pet? (2002) was the very first book you published under Lee & Low’s Bebop imprint. It’s always interesting to hear the story behind that first book publication. Can you tell us yours? GH: I call it the Little Book That Could. As short as it is, I labored over those 34 words. My critique group had a cake made decorated with the cover. My kids teased me. When I said book, they thought novel. But it’s still in print after all these years. And I like to think it launched my career. I feature it when I visit early elementary classes. It’s a book they can read on their own. It’s also available in Spanish and sometimes a Spanish speaking student will volunteer to read it. The look on their classmates’ faces is precious. Here’s the story behind the story. I’m a member of the Society of Children’s Book Writers and Illustrators (SCBWI). I read in their newsletter that Bebop Books was accepting submissions so I sent in one. They promptly rejected it. It wasn’t very good. Once I read that a writer could succeed if they learned their craft and were persistent. I studied other early readers and wrote five more. The editor accepted one, we worked on a few revisions, and I got my first book published! BBS: Early Readers are a very exacting, challenging type of book to write…perhaps even more so than other picture books because the language has to be both simple (since they are designed for emerging readers to read themselves) and engaging. Not an easy task, but you seem to have mastered the formula as you’ve published 12 of them, with more on the way. Craftwise, what is the key to creating a great early reader? GH: I like books where things happen. So I try to think of an interesting plot. One that kids will care about. School, family, and pets are usually good places to begin. And of course you want an interesting character. My books are written for the school and library market and sometimes I’ll have to use a vocabulary list. I know in advance how many words and pages I have to work with. I write the story, then rework it to fit early reader guidelines: word count, grade level, number of syllables, number of pages, etc. BBS: The Pet Club Series is your new series with Capstone. So far you have written 8 books for the collection and they’re selling extremely well. How did this project come about–did you write the books first, did you pitch the idea, or did the publisher contact you to write the series? GH: Capstone is known for their nonfiction and I love nonfiction, too. Every fall, Oklahoma has a state conference for librarians, EncycloMedia. About two years ago, I found out that Michael Dahl, author and editor at Capstone would attend. I decided it would be a great opportunity to meet him and let him know about my interest in Capstone. I went to the library and read his books so I could have a conversation with him, memorized his picture so I would recognize him, and staked out the Capstone booth. Finally, I saw him and introduced myself. But I couldn’t remember one thing from his books! He asked about my career and I told him I wrote some nonfiction, but mostly early readers. He said that their Stone Arch Books imprint would be publishing a second grade fiction series soon. Before I could think, my mouth opened and I said, “I’m great at those.” I whipped out my brochure to prove it. He asked if I wanted to write some and I said YES! He said he’d get in contact. And he did. First, I was asked to write four books about a pet club. I created four characters each with their own pet. They are best friends and have adventures together. Then my editor asked for four more. They were fun to write. And the illustrator, Mike Bryne did a great job. BBS: You ultimately did publish three NF books with Rourke Publishing…and they are both interesting and gorgeous. Please tell the educators, media specialists, and parents who are reading this all about them. Makers and Takers: Studying Food Webs in the Oceans. T hey are written for third – fifth graders. Besides focusing on food webs (the study of plants and animals in a certain habitat and what eats what), they discuss ways to keep our environment clean. I also talked with experts who study food webs. One was a biological oceanographer who works on ships frozen in the arctic. Another was a professor who takes his biology classes on scuba diving trips off the coast of South America to study food webs in kelp forests. I tried to show kids that the world is full of interesting occupations waiting for them. BBS: The business of publishing children’s books is not an easy one, and writers of color often have unique challenges to face in both the selling and marketing of their work. What are some of the challenges you’ve faced along the way? How have you dealt with/overcome them? GH: I’ve read the studies showing the tiny percentage of books written and/or illustrated by people of color compared to the total number of children’s books published. It is disheartening. I’ve also found when I talk to teachers and librarians, they are not aware of the books that are published. If they don’t know about them, their students probably haven’t been exposed to them either. I present workshops that introduce these books that are flying under the radar. They are wonderful books and the teachers and librarians are thrilled to see them. BBS: Whether as teacher or author, your commitment to the education of children is clear. What is the greatest hope you have for this current generation of kids? How can we help bring it to fruition? What role can literature play? GH: I hope that kids will be curious about the world around them. That they’ll never stop wanting to learn. I also hope they will read all kinds of books, especially those who claim they don’t like to read. It just takes that one special book to ignite a passion for reading. As a teacher, if a student said they didn’t like books, I tried to find one in my library I thought they might like. I even put a book in a manila envelope for a boy so his friends wouldn’t know he was reading for fun. We must work hard to put books into the hands of kids. BBS: What projects do you have in the works now? GH: I am hard at work on a picture book biography. BBS: Markers, colored pencils, or crayons? GH: Crayons – It’s hard to find sky blue. BBS: Godiva truffles or a Snickers bar? BBS: What’s the last childlike thing you did in public? GH: I rode the carousel at the mall. BBS: Thanks so much for your time, Gwen! GH: Thank you. It is an honor to be Day 24. Learn more about Gwendolyn at www.gwendolynhooks.com . So encouraging. So encouraging. Thanks for this interview. When you met Michael Dahl, where were you in your career? Were you still a math teacher? Also, did you already have a history of publishing books? and was your brochure like your resume? You are not kidding when you say that Gwendolyn Hooks is the nicest person. I had the opportunity more than once to interview her and feature her at Kristi’s Book Nook. I also had the pleasure of meeting her at the Missouri Writer’s Guild conference in January of 2016. Congratulations Gwen on all of your successes!